With talks about the new Philippine cyber crime law or the Republic Act 10175 (Cybercrime Prevention Act of 2012) all over the World Wide Web, not only in the Philippines but even elsewhere around the world, everyone should make a stand. It’s either you are against this law or you are in favor of it. As for me, I’m obviously against it. While I was attending the face to face session for a search engine marketing course on Oct. 2, there was an ongoing protest against this infamous newly enacted law. Citizens of the Internet, or netizens were called into arms, not literally but figuratively by masking their Facebook accounts with a black cover photo and profile picture. Thus, you’d find thousands upon thousands of web users, social network enthusiasts, bloggers, writers, website owners or developers, and countless citizens of the web demonstrating their protest through comments. But before we list down the reasons why the Philippine cyber crime law should not be supported, let me refer you to the page where you can actually read about the R.A. 10175. Speaking of comments, the number one reason why you should say no to the Philippine Cyber Crime Law is the insertion of libel amongst the punishable acts. This was included by Sen. Tito Sotto, although the original bill did not contain this provision. I wouldn’t wonder why since this senator had been the subject of scrutiny by various bloggers due to plagiarism issues. With the new R.A. 10175, politicians and public figures will now be able to file legal lawsuits against anyone merely expressing their opinion. In relation to this, my thoughts about libelous statements are rather different. I believe that opinions are purely opinions and remain as such whether it is backed up by facts or not. Thus, stating an opinion cannot be labeled as libelous in anyway considering the fact that opinions are weighed with both sides of the coin presented, not unless there is a specific and single idea one is driving at. With balanced presentation of opinions, whether based on facts or not, it cannot be libel. I know nothing about legal proceedings anyway so please refer to Article 355 of the Revised Penal Code. As to what type of lawsuits can be filed, it will be determined by lawyers. Still in relation to comments and expressing opinions, freedom of speech will definitely be affected by this new law. We can no longer be free to express thoughts, ideas, and opinions against anyone, particularly erring public officials without the fear of being criminally held liable for it. Did you know that through the R.A. 10175, law enforcement including the Department of Justice can actually ban the use of social network sites including Facebook and Twitter for certain individuals, parties, and everyone else as a whole if it deems necessary to do so? So that’s no more games, apps, photos, videos, posts, tweets, and online stalking for you. With numerous more relevant issues faced by the country today, it appears unnecessary to be spending as much as Php 50 million annually in terms of budget. The same amount is better off spent for more worthwhile projects. The Cybercrime Prevention Act of 2012 is not easy to implement. The National Bureau of Investigation (NBI) as well as the Philippine National Police (PNP) will need to establish a sort of cybercrime commission or division. This won’t be as easy as 1-2-3. There will be a need to acquire advanced technology equipment for tracking hackers and other types of cyber offenders. There will also be a need to train personnel to perform the job. These cannot be accomplished overnight and may actually go beyond the allotted budget. Does this sound like this law is rather useless? Not quite. It’s already in effect since yesterday Oct. 3 despite about 8 petitions filed against it already. The Supreme Court is deaf when and did not order a Temporary Restraining Order. But the battle is not yet over, groups like the Kabataan Partylist, representing the youth sector in the House of Representatives will be submitting the Netizens Bill of Rights when congress resumes on Oct. 8. In relation to this, a public discussion will be held today, Oct. 4 later on at 4:30 to 7 PM at the U.P. College of Law, Sarmiento Room. You may confirm your attendance through this Facebook link. You may also sign the petition initiated by the same party list through the website change.org through this link - Junk the Cybercrime Prevention Law! 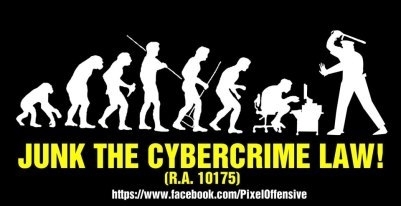 For the meantime, those are the 5 reasons why we should say no to the Philippine cyber crime law.